The switch is a double pole double throw (DPDT) switch. That way, with the switch configured as it is in the picture, the battery is being charged and is disconnected from the load, while the load is being powered by the external supply. 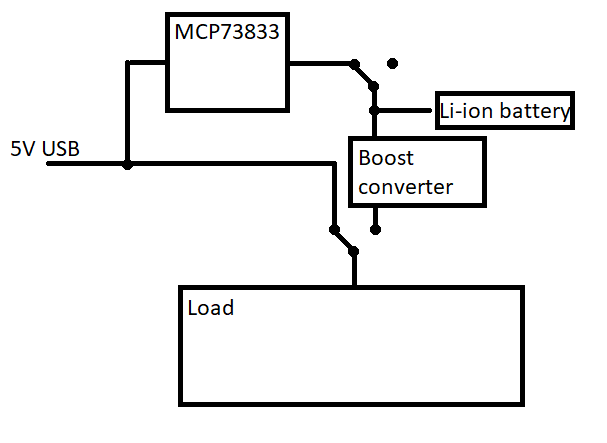 With the switch flipped, the external supply will be disconnected from everything and the battery will power the load (through the boost converter to reach 5V). I then discovered the MCP73871 which seems to automatically switch between the battery and external supply. It seems like a better (more simple!) method of implementing this charging circuit, however I am concerned that if the system load draws fluctuating current, I have heard it may affect the life span of the battery. I am also unsure from the datasheet of the MCP73871 whether the system load voltage (on the OUT pins 1,20) varies whether the external supply is plugged in (i.e. when the USB is plugged in is the load voltage 5V and then when the USB is disconnected the load voltage drops to 4.2V down to 3.7V as the battery is discharged). I'm guessing this doesn't matter however, as I can just use a boost converter again to bring the voltage back up to 5V. Using my circuit with the MCP73833 as shown above the system load always receives 5V. I am also concerned that as per the MCP73833 datasheet the maximum charging current with USB is 450mA. The Li-ion cell I am using is 3450mA so I would like to be able to charge it up to about 1.5A (~0.5C) which is a current I know is possible with USB phone chargers. Are there any advantages and disadvantages to either the circuit I made or just using the MCP73871? This is my first time dealing with charging circuitry so want to make sure I get everything right. I am leaning towards using the MCP73871 but want to make sure I understand fully the benefits before making a decision.